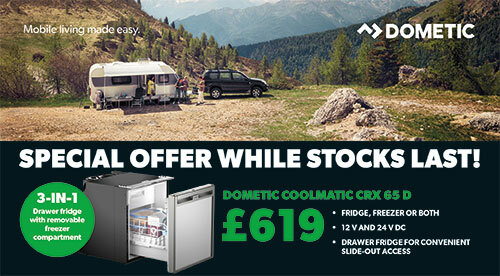 Welcome to our Caravan, Motorhome, Campervan and Boat fridges section which includes a wide range of 3 way, 2 way, Compressor and Absorption fridges and freezers to accommodate all your needs. Here at Jacksons Leisure Supplies we specialise in caravan and motorhome refrigeration - indeed all types of mobile refrigeration! We hold a large range of stock here in our warehouse and also have a display area where we have some of our most popular items on show including; Fridges, coolboxes, cookware and windows from such renowned brands as Dometic, Waeco, Vitrifrigo, Thetford, Smev, Spinflo, Cramer, Seitz and many more. Failure to do this can cause problems with warranty claims and is potentially unsafe. We have a sales and technical team with many years of experience in caravan and boat equipment, they are here to assist you in choosing the right item that suits your needs. Please feel free to call us on 0151 334 0222 if you require any help or advice and speak to our friendly and helpful team from Monday through to Friday!